"a mediterranean cullinary voyage from Beirut to Marrakesh"
10% OFF All Our Tagines on Thursdays so book your table and come and see us. 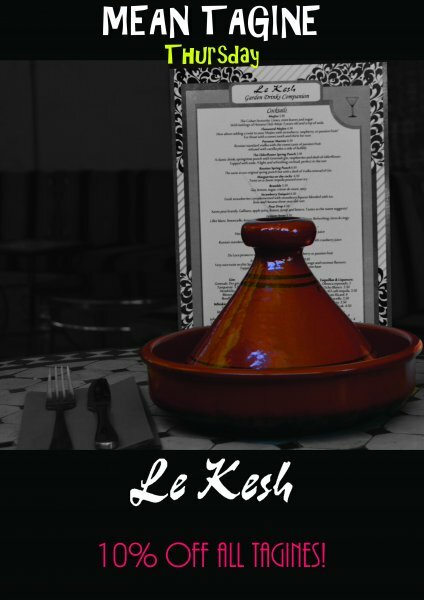 We are pleased to inform our customers that we starting from today Le Kesh will be open throughout the day Tuesday to Sunday and evenings on Mondays. Quick Lunch Offer: “Choice of Wraps and soft drink for £5”. Bring her in and treat her to our special offer on the day! Complimentary glass of Duval-Leroy Champagne. 2 and 3 course offers from £18! At Le Kesh we aim to provide for parties of all sizes. We have designed our Le Kesh Feast around large groups wishing to have a gastronomical experience at our restaurant. We offer a large selection of cold and hot starters and mains, chosen by the Chef to give you an opportunity to try most of our dishes. Minimum of 4 people. We endeavour to cater for dietary requirements, please contact us prior to your reservation. We are offering a two course meal and a glass of wine for only £11.95! This offer is available Monday and Tuesday and lunchtime only on Saturday for walk-ins and bookings. For more details please contact us on info@keshoxford.com or 01865 202077. Use the link below to reserve your table.